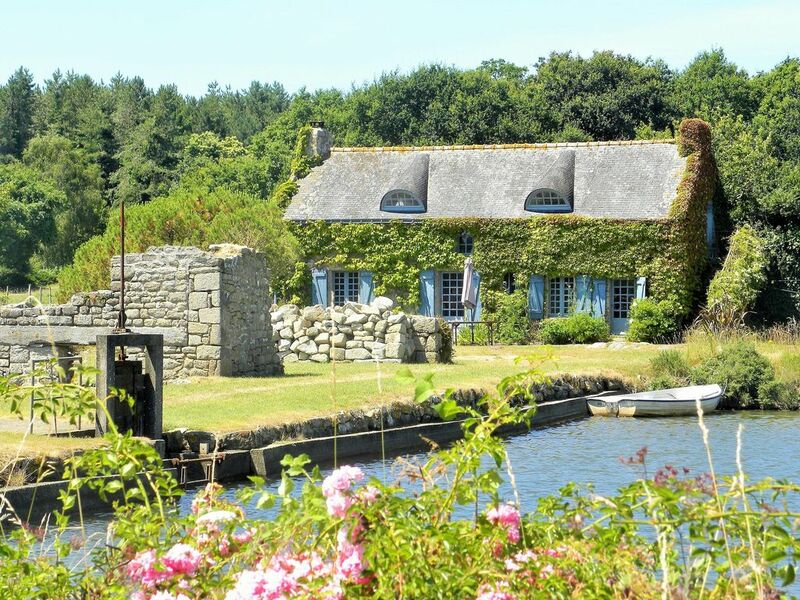 'Moulin de Berringue' is situated alongside the Ria d'Etel in Plouhinec, Brittany. Walking along the banks of the Ria, canoeing and bathing on the inner sea and the lake will make you enjoy your state. In 10 minutes you will find splendid beaches and the open sea with spots for surfing. 30 minutes drive from Carnac and the presqu'ile de Quiberon or the magnificent old city of Port Louis and its Indies Company museum. Comfortable living room with sea view. For 7 with a large sofa, TV and wood burner. Luxury kitchen with all facilities, ceramic hob, electric oven, fridge/freezer, dishwasher, microwave, washing machine, electric dryer, table and chairs to use as dining room. Golf de Saint Laurent at 20 min by car. 9 holes Par 35 - 2705m. 18 holes Par 72 - 6128m. we stayed at Moulin for 2 weeks and had a wonderful time, the sea lake was great for canoeing and fishing and there was lots to do and see nearby. i'd definite go again. Our second visit to the Moulin! We love the ever-changing views, and the children (12 & 10) love the kayaks and attempting to catch crabs. Perfect for a family of 4. We had a lovely week in the Moulin. It is situated in a wonderful setting with beautiful surroundings, even better than I expected. The cottage is great for 4 people, We had everything we needed. Would love to come back. We loved our weeks stay at Moulin de Berringue, it was all we had hoped for and more. Kids - 12 and 9 loved the kayaks we could use on the large lakes, and used the bikes available several times. Owner was v pleasant and friendly. Good central location for beaches, town, tourist attractions. Supermarket only a 10 min drive away. View forever changing due to tides coming on going out on the river, gite as pretty as it looks in the photo and exactly as described. Would certainly return! 3 canoes: 2 for 2 adults and 2 children, 1 for 2 adult and a child, life jackets; 4 bicycles. Canoeing is possible either on the private lake either on sea when the tide is OK. You can also have walks on the banks of the Ria through the "sentier côtier". Garden furniture comprises of a table, chairs and parasol to picnic looking at the ever changing sight on the Ria with so many kinds of sea birds. You could also enjoy fishing parties but fishing rods are not provided. Small beach on the Ria only 50 meters from the Moulin. 5 miles from great beaches on the open sea. Half an hour by car, beaches of Carnac and Quiberon with possible kite surfing an others beach entertainments. Roscoff. 2 hours 30 mins. Saint-Malo : 2 hours 45 mins. Booking Notes: Please confirm your interest on Internet. Upon application booking form is sent by e-mail or post. Upon completion 30% deposit non refundable on booking and the balance to be paid 1 week prior to arrival. Changeover Day: Changeover day on Saturday. Arrival at 2pm. Departure at 11am.